I think this might just be a blind spot in contemporary theology. We know that Satan hates God and marriage and evangelism and even church planting. But I have never heard anyone reference his hatred for the Holy Spirit. As I ponder this idea I see more and more evidence to support the statement used as a title for this post. Sure, there is the obvious logical agreement: Satan hates God, the Holy Spirit is God, thus Satan must hate the Holy Spirit. However, affirming the logic of a statement is not the same as pondering the implications. 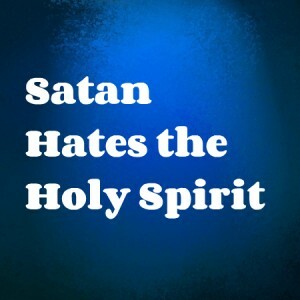 So why does Satan hate the Holy Spirit and how is this seen in everyday life? You can see the work of the enemy as you consider both the cults and secular society. In the cults there is always an undermining of the biblical doctrine of the Trinity – God is twisted from a gloriously loving tri-unity into a monadic power-broker (often seen as a devilish antagonist). In secular society the idea of God is also twisted into a perversion and caricature of reality and the convicting work of the Spirit is undermined by persistent indoctrination in the lie of autonomy and guiltless existence. Now, what about in the church? Surely once people become believers the enemy’s attack on the Spirit becomes fruitless, doesn’t it? I don’t think that is the case. Does the enemy stop attacking marriage once we are saved, or does the antagonism increase? Are we not tempted to sin once we are believers? Of course not, so I suspect there is a consistency here. So how does the role of the Holy Spirit suffer in respect to spiritual warfare? What is the enemy’s strategy to undermine the Holy Spirit’s work in our lives? It seems to me that Christians tend to feel a pull in one of two directions, both of which are away from the reality of the Spirit’s work. Both pulls negate the fact that the Holy Spirit is a person rather than a force, and both distract believers from a wonderful and central element of the Christian life. The first pull is to turn the Holy Spirit into a power-focused force. The Spirit becomes the fuel for Christian living and sometimes the fuel for spectacular displays of personal anointing. Undoubtedly there is truth in the mix here, but the corruption seems to come in respect to the emphasis and direction of focus. The power, or lack of it, tends to become the emphasis in Christian life and ministry. People caught up with a power-caricature of the Spirit tend to focus either on the Spirit, or on themselves. The second pull is to turn the Holy Spirit into a silent and benign figure. The Spirit is assumed to be at work in the normal things of church life by means of, well, various means. Undoubtedly there is truth in the mix here as He is surely at work as we read the Bible, hear preaching, etc., but the corruption seems to come in respect to the emphasis and direction of focus. The emphasis in Christian life and ministry seems to shift to habits and personal commitments. People buying into a means-caricature of the Spirit might tend to be focused on themselves and their diligence. The pre-eminent role of the Spirit is that of a communicator, specifically, relational communication between the Father and the Son, between God and us, and between us in the body of Christ. The Holy Spirit is primarily concerned with the power of love, not some sort of love of power. He pours out God’s love into our hearts and baptises us into Christ. The fruit of the Spirit is profoundly Christlike. He gifts us to build up the body of Christ that we might point each other to the head, who is Christ. That’s the key issue with the Spirit – he wants to lift the eyes of our hearts to Christ. And that is why Satan so despises the role of the Spirit. By forcing the focus onto ourselves, or even onto the Spirit himself, the enemy seeks to undermine the Christ-ward gaze of true Holy Spirituality. Perhaps this a factor in the strange phenomena of otherwise great Christian writers offering solid and helpful books, yet somehow many of them seem to remain blind to the importance of the Spirit in their discussions of living the Christian life, pursuing sanctification, living out Christian marriage, parenting or church ministry. The Spirit seems to be a blind spot for many. And where the Spirit is relegated or twisted in some way, then the bottom line will always be a drift towards an autonomous and self-driven “spirituality” (which was The Lie back in Genesis 3, of course). Perhaps we would do well to ponder the spiritual attack against the Holy Spirit. I suspect that if we were to ponder this, then we would find our hearts drawn to Christ. This is the goal of the Spirit, as well as the great fear of the enemy!